While the Syrian army was being routed in the desert by the alien backed rebels, another global crisis was unfolding in the Pacific theater. 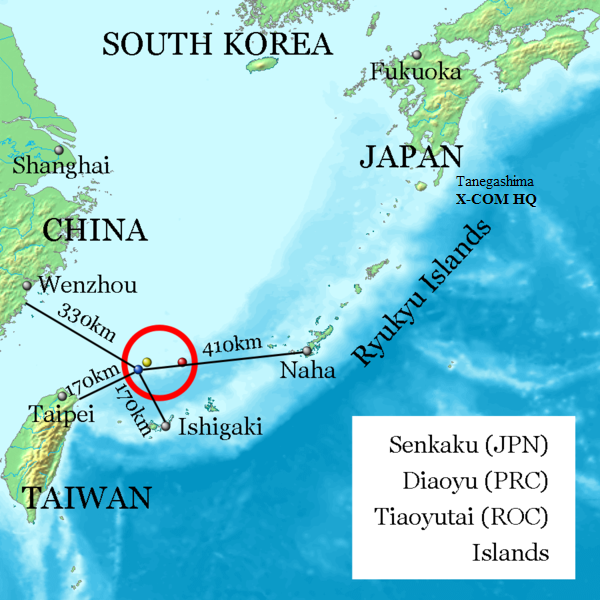 The Senkaku Islands (known as the Diaoyu Islands in China) were a disputed cluster of uninhabited islands in the East China Sea. Once considered worthless the discovery of natural gas reserves beneath the islands made them the fulcrum of a growing nationalistic dispute between Japan and China. The hotly disputed Senkaku Islands, roughly 1000 kilometres southwest of the X-Com base in Tanegashima. Japan and China have a long and fractious history, and the possibility of another conflict between these Asian powers in the 21st century had long been mooted by think tanks and global strategists alike. China's growth into a superpower was accompanied by a commensurate willingness to test the boundaries of her new status. The issue which raised the most conflict was China's willingness to dispute sea territories in the East and South China Sea. While the Japanese and Chinese wrangled over the Senkaku Islands, a similar dispute arose in the South China Sea between China, Vietnam and the Philippines over the Paracel and Spratly island chains. The Philippines sought international arbitration to challenge China's claim over these islands, and on 12 July 2016 the Permanent Court of Arbitration in the Hague found that there was no legal basis for China to claim historic rights to resources in the disputed area. 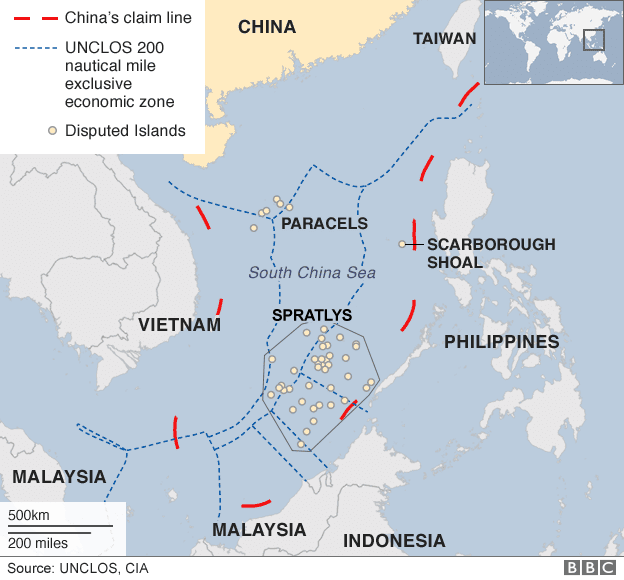 The disputed Paracel and Spratly island chains. While many of China's rivals celebrated the ruling, some commentators argued that the Philippines' victory in the international tribunal amounted to nothing, and would ironically only serve to harden China's position in future territorial disputes. These fears were borne out by the increasing escalation of tension in the East China Sea. China refused to attend the proceedings, and stated explicitly that they would not abide by the tribunal's decision. The Philippines and Japan put aside historical enmity stemming from Japan's brutal occupation of Manila during the Second World War, and became de facto allies with Japan agreeing to supply military equipment and navy vessels as a check to Chinese expansionism. US and Japanese joint naval exercises in both the East and South China Seas also grew apace, and Chinese spokesmen warned that war was imminent. On 6 August a large swarm consisting of over 200 Chinese fishing vessels entered the waters around the Senkaku Islands, prompting a formal protest from Japan. The Chinese government brushed it aside, and stated that the presence of the fishing vessels was in response to the movement of fish shoals rather than any strategic move on the part of Beijing. An unexpected incident, however, momentarily dampened the ardor of the hawks on both sides. On 11 August the Japanese Coast Guard rescued six Chinese fisherman after their vessel collided with a Greek ship and sank in contested waters. 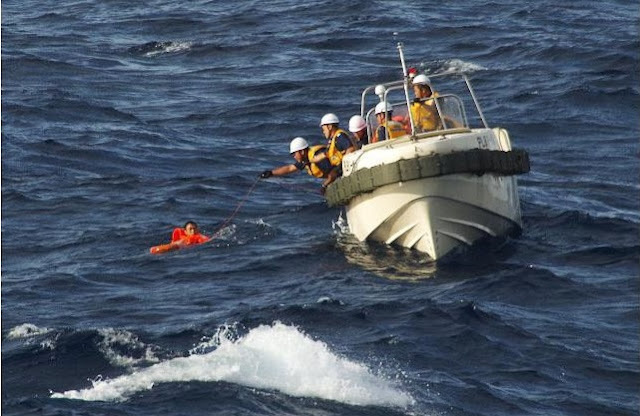 The rescue was called an act of "extreme benevolence" by Chinese commentators, and the Chinese government responded swiftly by thanking Japan. For several days the Chinese and Japanese governments put aside their enmity as their respective Coast Guard services coordinated to help locate eight more missing fishermen. For the first time it appeared that there might be the possibility of a future where these two civilizations could co-exist and prosper together instead of being perpetual antagonists. A member of the Japanese Coast Guard extends his hand to the Chinese fisherman wearing the red lifejacket. Hopes for peace proved to be a chimera however, as relations between the two nations swiftly deteriorated. Whatever slim chance for peace these two nations might have had vanished as a string of incidents served to further inflame national sentiments and spark off a major conflict in the region. On 18 August 2016 a Chinese national presented himself to the Taiwanese consulate in Taipei and formally asked for political asylum. Colonel Shaojie Zhang was a long time aide to Admiral Wu Shengli, the head of the Chinese Navy. Given the code name "Chilong" ("hornless dragon") by Taiwanese case officers, Zhang took advantage of a state trip to abscond with several sensitive documents and defect. While Chilong's credentials were impeccable, the story he gave to the Taiwanese debriefers beggared belief. Chilong claimed that Admiral Wu had been "compromised" by the visitors. Furthermore, he claimed that Wu was actively advocating open war within the People's Liberation Army (PLA) and the Communist Party of China (CPC) at the behest of the visitors, and had successfully gathered together a coterie of like-minded hawks keen to avenge the "century of humiliation" suffered by China. Among their expansionist agenda included the annexation of Taiwan, the military defeat of Japan, the expansion of China's sea borders, and most importantly, the ejection of the US from the Pacific. Chilong's account was accompanied by numerous recordings and documents, all of which appeared legitimate. Taiwanese intelligence, fearing that Chilong's offer was a ruse to provide China with casus belli (a provocation to war), refused his request for asylum. Taiwanese and Chinese relations had reverted back to Cold War levels since the ascension of the new female Taiwanese president in May 2016. President Tsai Ing-wen was an advocate of Taiwanese independence, and since taking office had adopted a risky policy of refusing to recognize the "one China" principle which subsumed Taiwanese independence to China. In response China suspended diplomatic ties with Taiwan, and deliberately slowed down the issue of travel documents, effectively destroying Chinese tourism to the island nation. China also used its position and influence on the UN Security Council to ensure that Taiwan was not invited to an assembly meeting of the UN's International Civil Aviation Organization. Taiwan was not a member of the UN, and China took every opportunity to block every attempt by Taiwan to have her sovereignty recognized. Tsai judged that Chilong's request and his preposterous claims were not worth further backlash from Beijing, and ordered his deportation. In keeping with her flexible, open-ended strategy, however, she first informed the Americans, the Japanese, and most importantly, the UN and the X-Com organization about Chilong's claims. Chilong was also deported to Hong Kong rather than mainland China, where he at least had a marginal chance of escaping as opposed to meeting a security detail of Ministry of State Security officials waiting for him to disembark in Beijing. Upon landing in Hong Kong Chilong's background as a special forces soldier and intelligence officer immediately made itself apparent as he easily evaded clumsy, last minute attempts by Chinese officials to apprehend him and disappeared into the city. Before he blended into the general population he made one final call to a Chinese PLA soldier who had served under him in the field. "Dacheng" Nguyen was a former member of the PLA Navy commando team known as the "Sea Dragons", and was now serving in the X-Com unit. Chilong's final message reiterated his request for political asylum, and his claims that the aliens were attempting a covert takeover of the world's governments. By August 2016 X-Com was facing a crisis over jurisdiction. The overt alien abductions in the opening months of the war had all but ceased, leaving little opportunities for the types of intervention which called for Skyrangers dropping out of the sky and disgorging squads of soldiers to sanitize an area. More and more it was becoming apparent that the aliens were integrating themselves in the geopolitics of the world. The most obvious example of this was in Syria, in which alien mechanical units were decisively intervening in the civil war on the side of the rebels. EXALT had clear ties to the visitors as made apparent by the advanced tech at their disposal, and the exact nature of their relationship remained worryingly opaque. There were also furtive whispers and rumors that the rise of the French totalitarianism was due to alien infiltration at the highest levels of government. Such talk was largely unsubstantiated, but for X-Com soldiers who had first hand experience fighting sectoids this particular conspiracy theory was fast gaining traction. Many X-Com soldiers could testify to the strange lapses, visions and hallucinations which occurred when fighting the small grey aliens, and it required no great leap of the imagination to envisage this happening on a larger scale. Chilong's claim offered an opportunity for X-Com to examine tangible evidence of alien infiltration, and to ascertain the aliens' methodology and aims. The problem, again, however, was jurisdiction. China made it clear that Chilong was a wanted fugitive, and his capture a domestic security affair. This was the crux of the problem facing the organization. There were no more "clean" operations, in which the sides were cut and dried, and government permission for interventions a mere formality. It was no longer an issue of humans versus the aliens - despite their best intentions to keep the organization apolitical, it seemed that the increasing predilection for the visitors to actively involve themselves in the affairs of nations meant that X-Com would have to become a political creature, too. In a historic meeting on 21 August 2016 the X-Com leadership finally decided to take full advantage of the powers given to it by the UN General Assembly. A clandestine squad designated as Kurogumi ("Black Team") was formed, composed only of the most trusted X-Com operatives, and sworn to complete secrecy. Kurogumi would be entrusted with the most sensitive operations, and would operate without any identifying markers of any kind. The operators were informed that the UN would disavow any knowledge of them in the event of being captured or killed. Kurogomi was formed as a direct result of three operational requirements. The first requirement was a request from a former X-Com operative named Pierre "Scree" Rousseau, who was making wild claims that former X-Com soldiers had been brainwashed and pressed into service as ADVENT soldiers in France. The second was to decide if X-Com should ascertain whether Chilong's claims about Admiral Wu's subversion were substantiated, which would entail violating Chinese sovereignty and assisting and harboring a wanted fugitive. The third was the pressing need to investigate the EXALT organization in Syria, which was now inexorably tied to the rebel movement and openly assisted by alien mechanical units. All scenarios required X-Com to pick a side in the internal politics of a sovereign nation, of which two - China and France - were permanent members of the UN Security Council. In the end the decision fell to UN Secretary-General Ban Ki-Moon, and he was unequivocal in his belief that the general mandate given by the General Assembly in January 2016 was sufficient justification for X-Com to send clandestine units into Syria, France and Hong Kong. 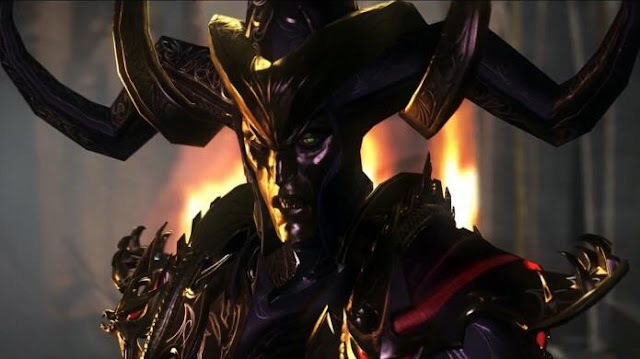 Ban also stated that he would take the responsibility for any fallout stemming from X-Com's action, reminding all present that his term would end in December 2016. Despite his professed willingness to accept all responsibility, Ban urged General Bradford to exercise all possible discretion in the deployment of clandestine units. In a private conversation between the two men, Ban said to Bradford: "I am quite willing to fall on my sword - but I would prefer not to, unless it is the only option available." The only dissenters in the meeting were the Japanese, who were quite sensitive to matters pertaining to China. Prime Minister Abe stated that Japan would continue to offer manpower, material and staging areas for X-Com, but would prefer to distance themselves from actions that might increase tensions between the two nations. To this end General Kiyofumi Iwata, the nominal head of X-Com, would step down as Force Commander, and General Bradford would assume overall command of the task force. 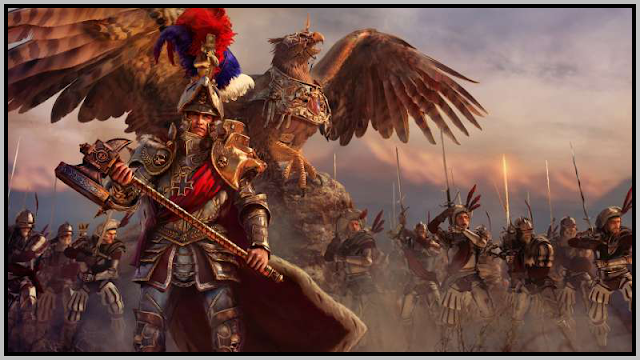 There was some discussion about removing Bradford from command and appointing a European or an African instead, but it was quickly dismissed. Bradford had earned respect and prestige for his conduct at Ogbomosho, and Secretary of State John Kerry, also present at the meeting, added ruefully: "No one in Beijing is going to believe that the US and Japan aren't pulling the strings behind the scenes. Might as well give them an American to throw tomatoes at." Unfolding events would quickly make all of X-Com's attempts at diplomatic niceties moot. In 2013 China unilaterally established an Air Defense Identification Zone over the disputed Senkaku/Diaoyu islands, and demanded that any aircraft wishing to enter this airspace report themselves to China first. This zone was studiously ignored by the US, Japan and Taiwan, all of whom disputed China's sovereignty over the airspace. Aircraft on all sides frequently flew in close proximity to each other in a dangerous and provocative game of "chicken" over the islands. China accused Japanese fighters of locking on their jets over the East China Sea on 17 June 2016. This mirrored an incident in 2013 when the Japanese accused a Chinese frigate of locking on to a Japanese destroyer. Locking on a target by fire control radar is the most provocative act short of firing missiles, and can be grounds for retaliation. Thus far only strict rules of engagement, human steadiness under pressure and awareness of the stakes involved had prevented an incident in the East China Sea. 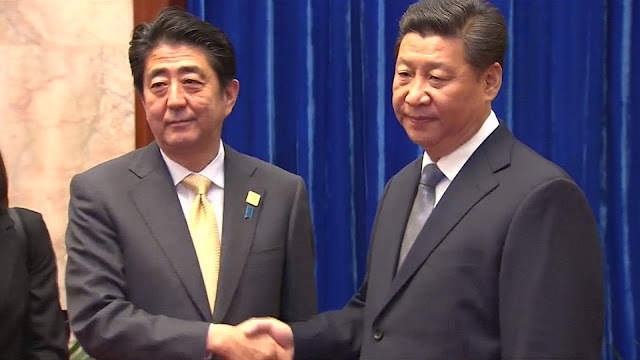 Prime Minister Shinzo Abe (left) of Japan and President Xi Jinping (right) of China can barely conceal their disdain for one another. On 27 August 2016 a Chinese W-50 drone was spotted by Japanese AWACs over the islands, and four Japanese F-15Js were scrambled to take a closer look. In response the Chinese scrambled two Su-30 Flankers and two Chengdu J-10s to verify and monitor the presence of Japanese fighters over the disputed airspace. Upon arriving at the drone's location the Japanese pilots were unable to locate the drone by radar. One pilot - "Godzilla" Tabata - later claimed to have seen a UFO lurking in the clouds. His claim was not corroborated by flight data, and Tabata himself stated that the UFO did not register on their radar arrays, but he was adamant that both he and his wingman saw the alien craft. Shortly after losing sight of the alleged UFO, the Japanese encountered the Chinese aircraft, at which point one of the Japanese received a warning that his aircraft was under lock from fire control radar. The pilot immediately began evasive maneuvers and fired off countermeasures. Shortly afterwards two other Japanese jets received lock on warnings, including several missile warnings. The Japanese, under severe duress, engaged the Chinese fighters and shot down three Chinese jets for the loss of two of their own. The Chinese account of the encounter played very differently. According to the Chinese, there was no drone over the Senkaku/Diaoyu islands, and their jets were scrambled when their radar picked up the incoming F-15Js. Upon locating the F-15Js they were immediately fired upon and lost two fighters before they had a chance to react. The remaining two fighters engaged the F-15Js and destroyed two Japanese fighters before a third Chinese fighter went down into the sea. At this point the sole remaining Chinese fighter successfully escaped from the combat, while the remaining Japanese fighters were recalled to await the fallout of the incident. 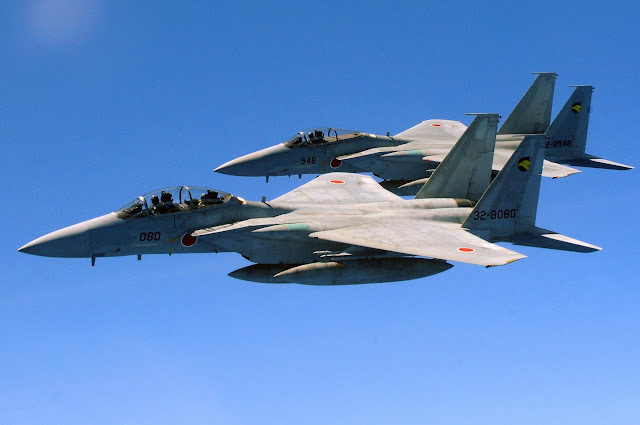 A pair of Japanese Mitsubishi F15Js. Both nations reacted with a predictable mix of outrage and fury. Nationalistic sentiments were fanned to blazing heights. Demagogues railed on talk shows and on the Internet. Japanese shops in China were ransacked and pillaged in the same way they had been when the islands first became contested in 2012. Unlike 2012, however, the Japanese began to retaliate. Total defeat in the Second World War had muted the nationalistic movement in Japan for over 70 years and discredited militarism as a bankrupt policy leading only to ruin and devastation. Japan had learned that as long as she was willing to play second fiddle to the US she would prosper and grow in the Pacific. Her previous attempt to contest American hegemony had ended in disaster. The running conflict with China, however, was awakening a more belligerent Japan, one whose martial roots went back for hundreds of years. As for China, their national policy was driven by the need to never again be humiliated by the West or by Japan, who had occupied Manchuria in 1931 and were responsible for shocking atrocities at Nanking in 1937. Unlike the US, long accustomed to being winners in her wars, China had been defeated and occupied by the British, the Americans, the French, the Germans, the Italians, the Austrians, the Russians and the Japanese during the period known as the "century of humiliation". There was no way for either nation to back down from this confrontation without a humiliating loss of face. At 3.12 am Eastern Standard Time President Obama of the US received a phone call from Prime Minister Abe asking for assurances that America would uphold her obligations under the Treaty of Mutual Cooperation and Security. Japan, in plain English, was asking whether the US would join her in her war against China. "Before he blended into the general population he made one final" I think you left out the rest of that sentence. Fixed it - thanks for pointing it out! It's going to be messy should China and Japan go to war (at this point we are WELL beyond the parameters of actual XCOM), so I'm not sure how XCOM wouldn't be dragged in. Either XCOM extracts Zhang and proves Alien infiltration in Chinese High Command, and maybe manages to avoid WWIII, or this sucker'll be going nuclear. Actually I don't know yet. I figured though that if you're the aliens and you have all the infiltration stuff at your disposal - mind control, skulljacks, stealth tech (Seekers), thin men, Faceless, possession (from The Bureau) - not to mention collaborators, colluders and willing partners - why bother invading the Earth when you can just make it destroy itself from the inside? Well, it really depends. 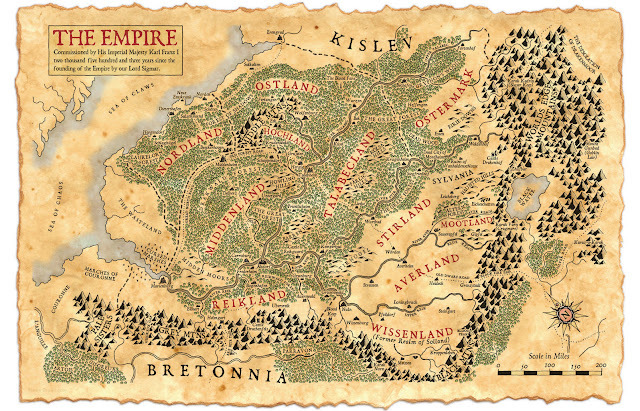 I'm kinda surprised that what's left of the non-alien controlled world hasn't rallied against the Invaders. I suppose it's going to come down to XCOM doing some real work to expose what's going on in occupied territories. Say, take out an alien base in France, and show the world what happens to the abductees? As petty as nations can be from time to time, what the human race has always been good at is unifying against a common threat. Give them a reason to raise their arms, and the Ayys won't know what hit them. You just gotta last until that comes. I'd like to think that humans would unify against a common threat, but it's so easy to divide and conquer as the aliens. In fact the Ogbomosho event in the story was the worst thing the aliens could have done because it gave them the human race something to rally around. If they stayed covert they could mount an effective takeover of the world without firing a shot. That for me is the hardest part of writing the story. What possible reason would the aliens have for going overt and giving humans the chance to rally, especially with the infiltration options they have? But if the aliens didn't go overt then there would be no impetus for the creation of a globe trotting organization like X-Com, which is kind of a central part of any fan fiction based on the video game. You could have small, national based organizations based in one of the superpowers, but their reach would be drastically limited compared to something which has a UN mandate on its side. In my version of the X-Com universe only X-Com suspects alien infiltration in France and China. Mind control is still a conspiracy theory. How do you prove mind control? A: Are you mind controlled? A: You're just being made to say that. B: Are you being mind controlled? B: You're just saying that. B: No need to be rude. A: Sorry. They made me say it. Glad yo have you writing again. A very entertaining read. I cant wait to see it unfold. Thanks man. Hopefully will have a long entry completed by next week.